In December of 1927, Claude Willoughby has been left behind in Maryland as his father, sister, and step-mother return to Kentucky for Christmas. The cruel abandonment is Claude’s punishment for disobeying his father’s directive. Sam Feldman comes to Claude’s rescue by inviting him and their friend, John Welles, over for an after-the-fact Hanukkah celebration. After a meal of brisket and latkes, the boys play dreidel with Sam’s mother, Gladys. Although the game is meant for children, I know quite a few adults, myself included, who get caught up in playing dreidel every Hanukkah. In fact, we have a tradition that last year’s winner must return to defend his or her title the following year. The Hebrew word sevivon or s’vivon means to turn around. 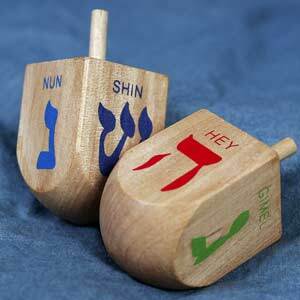 Dreidel is the Yiddish word for a spinning top. All dreidels have four Hebrew letters on them which stand for the saying Nes gadol haya sham, meaning a great miracle occurred there. In Israel, instead of the fourth letter shin, there is a peh which changes the saying to Nes gadol haya po, a great miracle occurred here. At the beginning of each round, every participant puts one game piece into the center pot. In addition, every time the pot is empty or has only one game piece left, every player should put one in the pot. Nun means nisht or nothing. The player does nothing. Gimmel means gantz or everything. The player gets everything in the pot. Ahhhh, the driedel game. Such great memories. I look forward to play every Hanukkah.